Symbiosis & Environment - Sheila A. Kitchen, Ph.D.
Lipids play a central in symbiosis, providing both cellular structure and energy storage, but little is known about how signaling lipids participate in onset and breakdown of symbiosis between cnidarians and dinoflagellates. ​Signaling lipids, sphingosine (Sph) and sphingosine-1-phosphate (S1P), play a pivotal role in determining cell fate, where increased Sph drives apoptotic activity within the cell while S1P promotes cell survival. The balance of these lipids creates the ‘sphingosine rheostat’ controlled by enzymatic reactions of sphingosine kinase (SPK) and sphingosine-1-phosphatase (SPPase). A recent study demonstrated that exogenously applied sphingolipids could alter the cnidarian-dinoflagellate partnership (Detournay and Weis, 2011), however endogenous regulation of the rheostat in cnidarians has not been characterized. 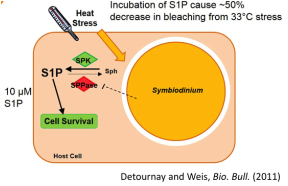 ​During symbiont colonization the rheostat shifted toward cell survival and under hyperthermal stress the rheostat shifted to cell death after exposure. Collectively these data suggest that sphingolipid signaling plays a regulatory role in cnidarian-dinoflagellate symbiosis. Onset of symbiosis is important to the metamorphosis of upside-down jellyfish, Cassiopea xamachana. Building on my findings with Exaiptasia, I want to explore the effect that sphingosine kinase inhibitor, a key enzyme in symbiosis onset, might have on the colonization and subsequent metamorphosis of these jellyfish. This is a collaborative project with Aki Ohdera, a postdoctoral researcher at Carnegie Institute of Science, and Angela Poole, an Assistant Professor at Berry College.